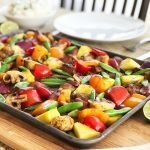 This Hawaiian Chicken Sheet Pan Supper is made with chunks of flavourful marinated chicken, roasted vegetables and roasted pineapple. A simple and quick dinner that everyone will love! In a small saucepan whisk together the pineapple juice, brown sugar, soy sauce, minced garlic, minced ginger, fresh ground pepper, and salt. In a separate small bowl, whisk together the cornstarch and 1 tbsp pineapple juice. Whisk the cornstarch mixture into the mixture in the saucepan. Over medium heat, bring the mixture to a low boil. Whisk the mixture continuously until it thickens. This will take about 3 – 5 minutes. Let the mixture cool before adding it to the chicken. Once the mixture has cooled, add it to the chicken. I like to marinade mine in a ziplock bag so that I can massage it, but you can use a bowl as well. Let the chicken marinade for at least 1 hour, or even overnight. NOTE: don’t let the chicken marinate any longer than overnight…the pineapple juice may make the chicken mushy. Prepare all of the vegetables and pineapple by cutting them into 1 inch chunks (except for the snap peas). Toss the chopped veggies (except for the snap peas and pineapple, leave them out) in the olive oil, lime juice, minced ginger and salt & pepper. Onto a sheet pan, lay out the marinated chicken, pineapple and veggies (except for the snap peas). If it doesn’t all fit, you can bake the rest on another sheet. Roast for 35 minutes. Then after this time, add the snap peas and continue roasting for 5 more minutes or until the chicken is cooked through.